I am a sinful person (as if the Evil in my blog’s title was not proof enough). This tart is proof of my sinful ways. You see, in my heart of hearts I am a slothful person. Don’t tell anyone, but there is nothing I like better than to spend a lazy day at home in my jammies watching movies while I neglect the housework, and my adult responsibilities. I have overcome my lazy nature for the most part, my lazy days are few and far between, but sometimes I slip. Like when I want a pretty, fancy, very special treat that looks like I slaved when I did no such thing. I guess add vanity and deceit to my list of sins! Oh dear. Anyway, this tart looks like it takes a lot of effort, but it is the work of moments, and it can be made a day ahead. Bonus! 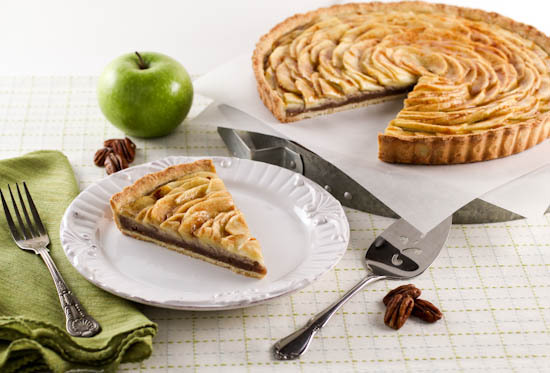 It is made with a super easy to work with crust, a homemade filling made primarily in a food processor, and topped with thin slices of apple. See, easy! 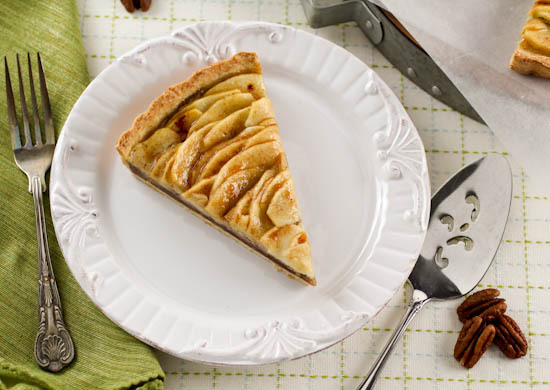 I love traditional frangipane, that sweet paste made from ground almonds, sugar, and eggs. As I prefer pecans, I decided to try making a pecan version of frangipane. It worked like a dream! 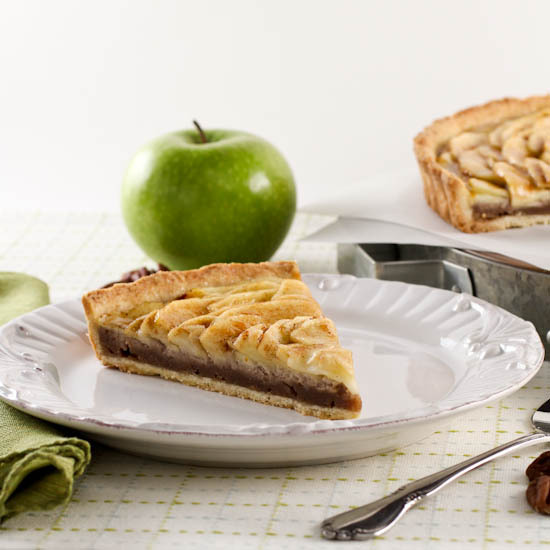 It produces a thick, buttery yet not overly sweet filling that pairs well with tart apple. Granny Smith was my preference here, to help keep the sweetness in check, but any firm baking apple you like would be fine, just be a little more sparing with sugar on top of the tart if you have a particularly sweet apple. Everything is arranged in a short crust pastry, which is really like a giant butter cookie. What I like about this crust is how easy it is to work with! It rolls out really quickly and is less prone to tears and cracks. 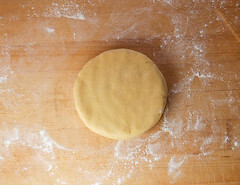 Just be sure to work with it in a floured surface and keep it cool. 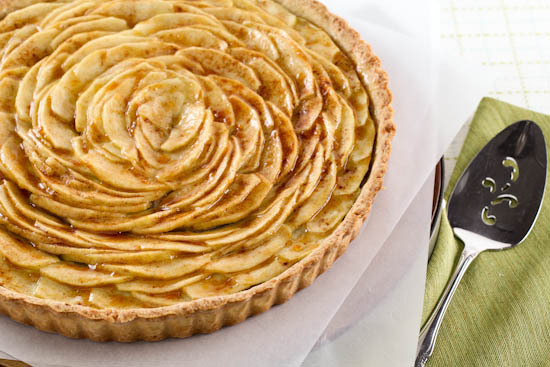 As I said before, you can make this tart a day ahead, just store it in an airtight container in the refrigerator. Let it come to room temperature before serving. This is perfect with coffee or a scoop of vanilla ice cream. Or both. Because, as I am counting my sins now, I am also riddled with greed! 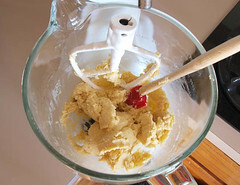 In the work bowl of a stand mixer fitted with the paddle attachment, or in a medium bowl with a hand mixer, combine the butter and sugar and mix on medium speed until light and fluffy, about 2 minutes. 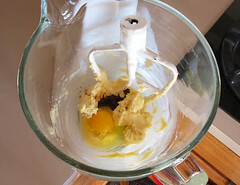 Add the egg, vanilla, and salt and beat on medium speed until thoroughly combined, about 30 seconds. 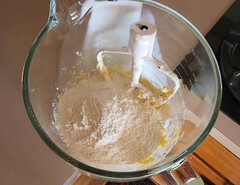 Add the flour and mix on low until the flour is absorbed, then increase the speed to medium and mix until the dough clumps on the paddle, about 20 seconds. 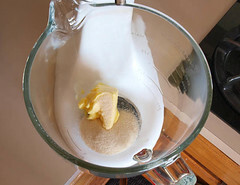 Turn the dough out onto a lightly floured surface and knead about 10 times, or until the dough forms a smooth ball. Wrap the dough in plastic and chill for 30 minutes. While the dough chills prepare the filling. 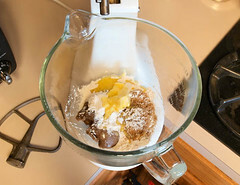 In the same work bowl you used to prepare the crust add the pecan paste, sugar, butter, flour, and egg. Beat on low speed for 30 seconds then turn the mixer up to medium high and beat until the mixture is lighter in color, about 1 minute. Once chilled pull the dough out of the refrigerator and let stand for 5 minutes to warm up. Roll out on a lightly floured surface to ⅛-inch thick, about a 14-inch circle, turning the dough often to make sure it does not stick. Dust the surface with additional flour if needed. 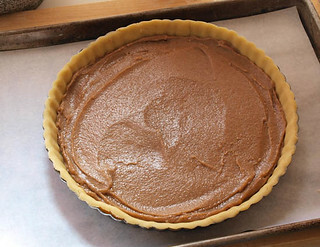 Gently tuck the dough into an 11-inch tart pan, making sure not to stretch or pull the dough. 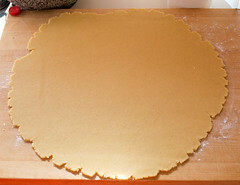 Once you line the tart pan remove any excess dough by rolling your rolling pin gently across the top of the pan. 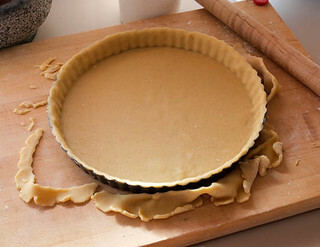 Spread the pecan filling evenly inside the tart pan. 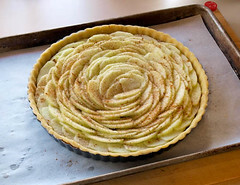 Starting at the outside, layer the apple slices onto the filling in concentric circles. Dust the apples with the sugar and cinnamon. 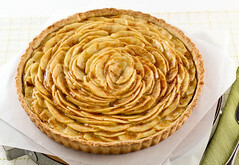 Bake the tart for 35 to 40 minutes, or until the crust is deeply golden and the apples are very tender. Cool completely to room temperature before unmolding the tart. Brush the top of the tart with melted apricot jelly before serving. 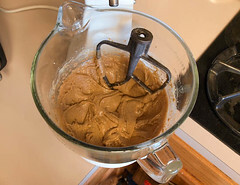 *To prepare the pecan paste place all the ingredients into the work bowl of a food processor or blender. Pulse until the nuts are ground then let the machine run until the paste is smooth, about 2 to 3 minutes. Transfer to an airtight container and chill for 1 hour before use. Keeps for 1 month in the refrigerator. © 2014, Evil Shenanigans. All rights reserved.